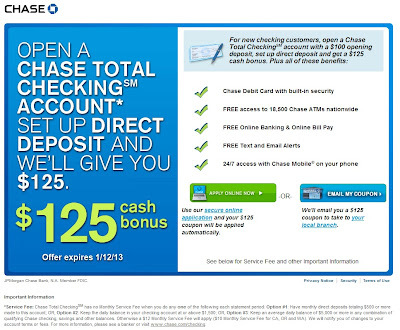 Just enter "Chase 125 checking"or "Chase 150 checking" in Google Search for latest Chase checking offering. 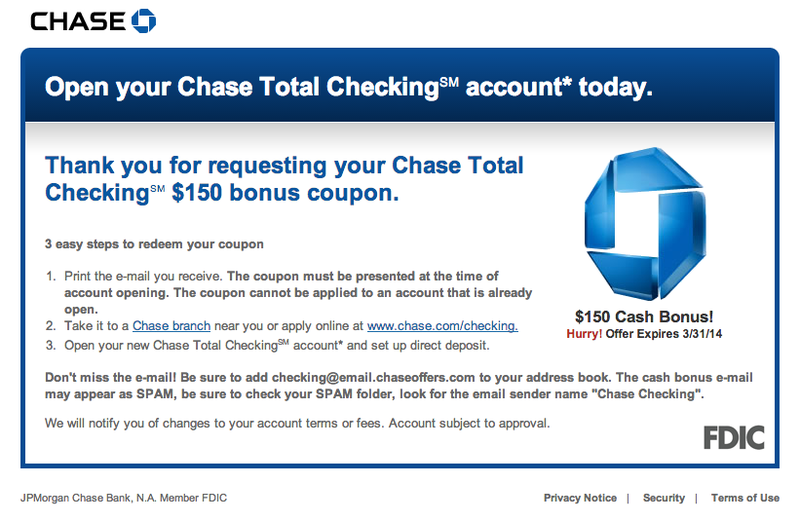 Although Chase promo page says expires on 1/11/2014, when I clicked on "Email Coupon" button, the next page says 3/14/2014. I entered my email address, received the promo code right away. My best friend said he is eligible for $200 Chase Total Checking account bonus, informed via his Chase credit card profile. 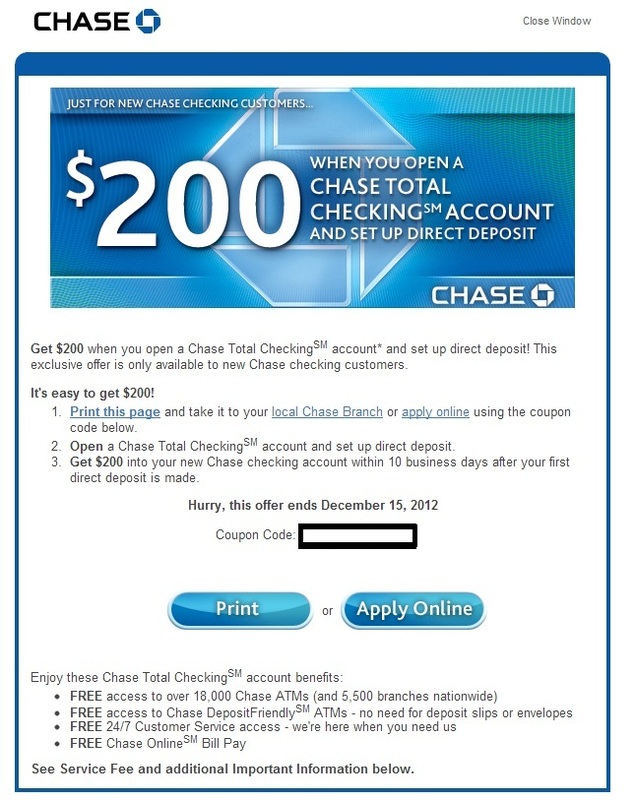 I verified this even though such promotion does not appear in my Chase credit card profile. He already has Chase credit card. I am an existing Chase credit card holder. 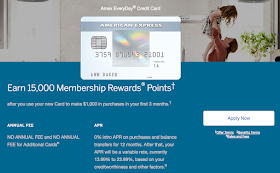 I apply for new Chase checking account, because Chase banking account improve my FICO score, and will increase chances of new Chase credit card approval. 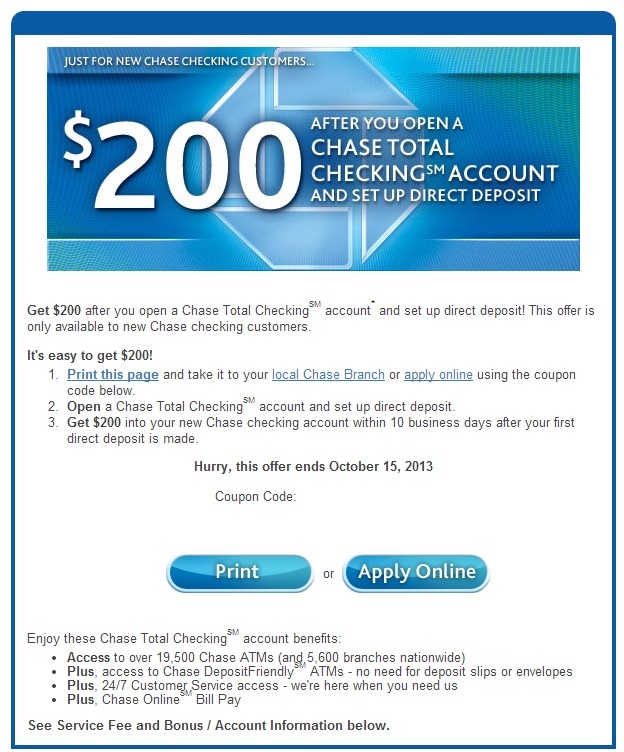 For Chase $200 Checking account promotion, expires on December 15, 2012. 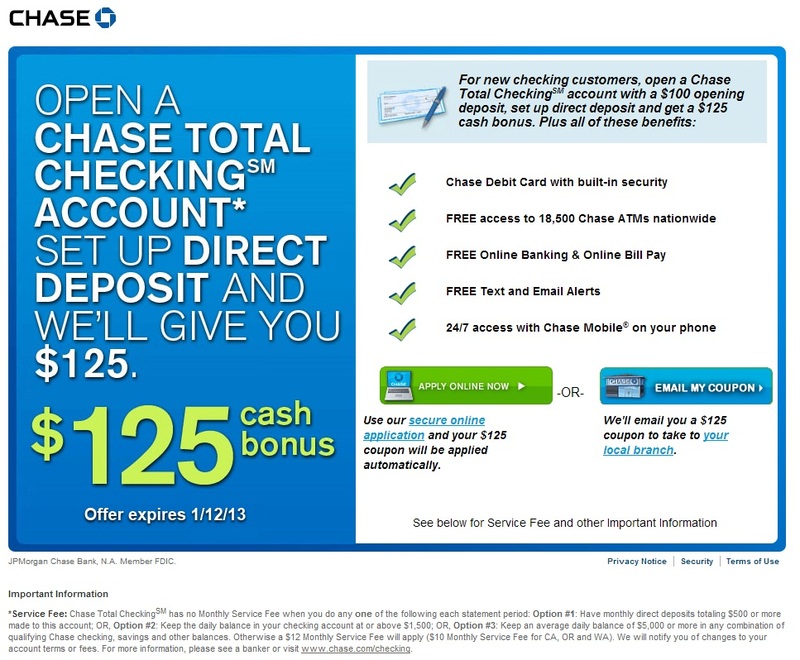 If you never have a Chase checking account, log into your Chase credit card account profile, this promotional ad may show up. Both have the same legal policy, except the expire date. Chase Total CheckingSM has no Monthly Service Fee when you do any one of the following each statement period: Option #1: Have monthly direct deposits totaling $500 or more made to this account; OR, Option #2: Keep the daily balance in your checking account at or above $1,500; OR, Option #3: Keep an average daily balance of $5,000 or more in any combination of qualifying Chase checking, savings and other balances. Otherwise a $12 Monthly Service Fee will apply ($10 Monthly Service Fee for CA, OR and WA). We will notify you of changes to your account terms or fees. For more information, please see a banker or visit www.chase.com/checking. 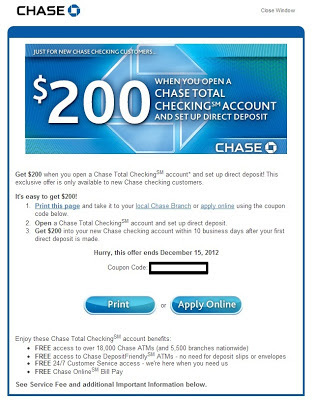 Offer not available to existing Chase customers, those with fiduciary accounts, or those whose accounts have been closed within 90 days or closed with a negative balance. Offer valid through 1/12/13. 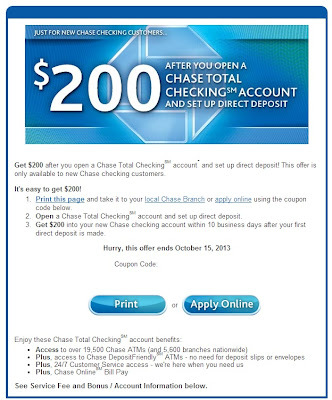 To receive the bonus: 1) open a new Chase Total CheckingSM account, which is subject to approval; 2) deposit $100 or more within 60 days of account opening; AND 3) have your direct deposit made to this account within 60 days of account opening. The green-highlighted option will be the option I will follow. I checked my new Chase Total Checking account later, $125 is received. 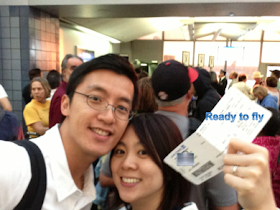 In January 2013, as shared in my Chase $150 bonus blog, my wife opened her own Chase checking, and received the bonus too.